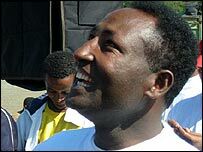 An Ethiopian man has broken his own unofficial world record for laughing non-stop. In the main square in the capital, Addis Ababa, at the weekend, Belachew Girma said a short prayer, knelt down on the gravel in Meskel square and began to laugh. Seeming to defy what was humanly possible, the noise just went on and on - a mixture of loud guffaws, cackles and a sprinkling of giggles. As he laughed he walked through the crowds of curious onlookers, trying to get others to join in with him. And it worked, it was infectious, and practically impossible not to laugh with him. But laughter is no joke for this world record holder, for there is a very serious point to what he was doing. Belachew thinks laughing is very therapeutic and in a country where 13 million people need food aid there is not always much to laugh about. "We are living full of stress... Natural disasters, economical, political, social problems... My aim is to minimise this stress. Please let us communicate by smiling," he said. "Our slogan is 'laughter, love, peace for all human beings'." In all, Belachew managed to laugh for two hours non-stop - exceeding his previous record by 20 minutes. But sadly for him, the record will not be validated as there were no officials from the Guinness Book of Records present. However, he is planning to do the whole thing again in Germany next week. And at least he had a good laugh.